This requires you to log on to the website. If you have trouble with this, use the “forgot password” link, and check your spam folder (because of phishing, its not unusual for password resets to be classified as spam). If a reset link does not arrive within half an hour or so, contact secretary@gmail.com to confirm your status. If you are a project or affiliate wanting to add information to the members only section, please contact a committee member. Members only content can also be added to specific pages (e.g. project pages), but I haven’t worked out a good way of highlighting that yet, nor added it to any of the frontend forms. 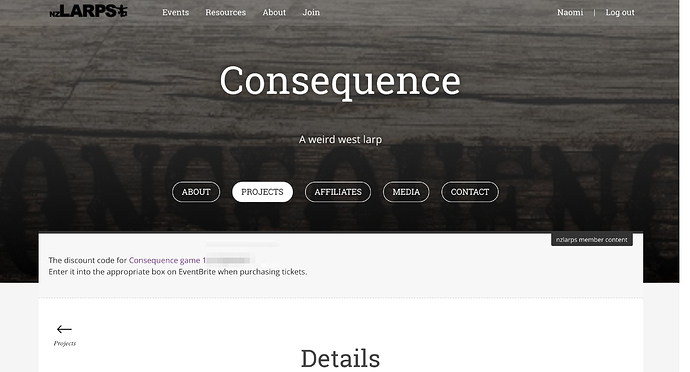 Event submitters can add nzlarps member-only content to their events. Guess we don’t need a members-only page much longer then We can just put stuff on the relevant projects, affiliates, and events. Its nice to have a page for ongoing discounts related to membership in the membership section. Even if it just linked off to/highlighted the projects that were currently offering discount codes. Ah, but we could just have it all as members-only content on the existing “benefits” page. Oh good point. Yes, for now the Members only page has been made redundant a day after it was built. Though it also acts as an ancestor for the “Add an Event” Page, so its still useful from a code perspective at least.